Communal Penance Services or Reconciliation Services are held during Advent and Lent at parishes. Sometimes parishes combine services for this sacrament. All are always welcome regardless of what parish a person is registered at and even if they aren’t a registered parishioner at any parish yet. Advent and Lent are wonderful times to celebrate the reconciling love and the healing graces our Lord offers us. Like all religious experiences, it takes preparation. Usually, a communal penance service includes a Scripture reading and brief exhortation by the priest. 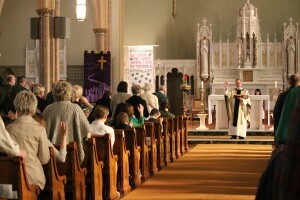 This is followed by an examination of conscience, and then the entire community prays the Act of Contrition together. Sometimes, a single, general penance is assigned to everyone participating; at other times the assignment of a penance is done during the individual confession. After the communal part of the ceremony, those present will individually confess their sins to the priest and receive absolution and a penance if it has not been assigned in the communal setting. The Act of Contrition is not repeated privately, because it has been part of the communal section of the service. The words of absolution are said by the priest individually over the penitent or a collective penance is given.